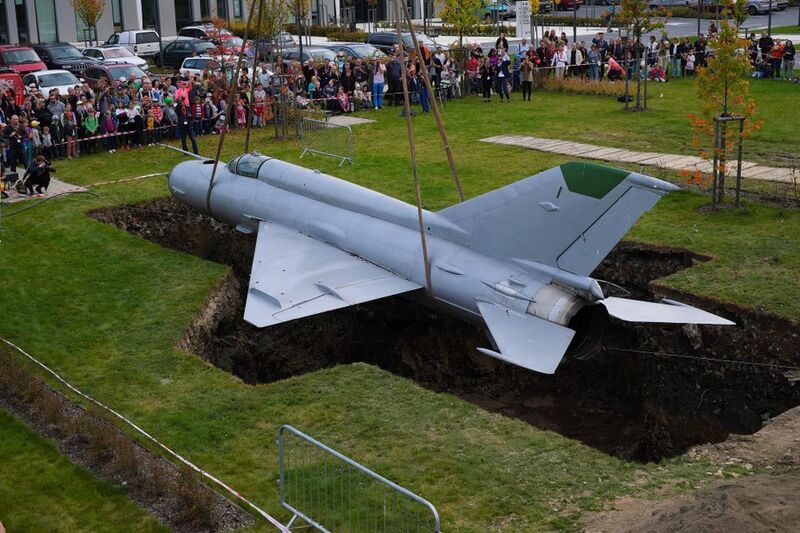 The UK artist Roger Hiorns has buried three decommissioned planes in the UK, Czech Republic and the Netherlands as part of an ambitious, ongoing land art project that has only now come to light. “I was thinking about a single burial but over time the idea has evolved into a network, a number of planes internationally,” Hiorns said in a BBC Radio 4 programme broadcast yesterday (The Man Who Buries Planes, 19 April). One of the planes is in an undisclosed location in the East of England. “It’s a work near the river Orwell outside Ipswich, where George Orwell used to play,” Hiorns tells us. “It’s buried in a deep hole of chalk hillside on farmland. It’s not publicly accessible, and in fact it’s now a dense meadow.” Farmer Tim helped Hiorns bury the aircraft. “It was a big crucifix really, it was four metres wide and four metres deep,” the farmer told the BBC. Meanwhile, a Dutch collector commissioned the artist who had obtained a British aerospace 1984 model from a military airbase in East Anglia. The plane was dismantled, re-assembled and buried in Haarlem in February. “You can enter the plane; the final piece of concrete infrastructure, a spiral stairwell is all that needs placing,” says the Turner Prize nominee. Late last year, another plane project got off the ground when 400 people saw a Soviet-made MIG21 jet plane enter the grounds at the Eli Beamlines Laser facility in Prague, a laser laboratory for physics and material research. The project was funded and co-organised by the Galerie Rudolfinum in Prague. Meanwhile, Hiorns is in discussions with an evangelical priest in Nigeria about burying a plane in Abuja. “He is showing a new direction to his congregation, he's in no hurry." An earlier plan to bury a decommissioned Boeing 737 jetliner in Hiorns’s hometown of Birmingham, UK, is now on hold. The project was due to be realised in collaboration with Ikon Gallery. “There were more pressing priorities in Birmingham for its money to be directed; Ikon were having local authority funding cuts,” Hiorns says. The plan could still go ahead though. ‘It’s a simple agreement [with Ikon], whether it’s next month or in 15 years time, or 50 years time,” he adds.